← The Narragansett at Cocumscussoc. Several years ago, during the celebration of Providence’s 375th year, the tercentenary celebration, Brown University’s Haffenreffer Museum sponsored lectures that included a talk by Paul Robinson and Doug Harris on the federally sanctioned investigation of the lands at Nipsachuk, the site of two battles during King Philip’s War, and long thought to contain a Narragansett burial ground. An exhibition was also collected and placed on display from the Museum’s considerable collection of artifacts and named “Customes Manners & Worships. Rhode Island Begins.”. Included in the montage of pictures used in the design of the poster is an iconic image familiar to many Rhode Islanders, for the original painting hangs in the American wing of the RISD Museum. 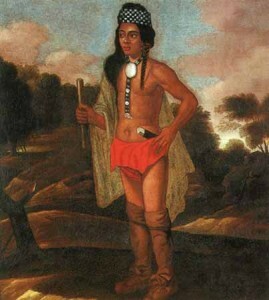 This portrait, long thought to be the image of The Niantic/Narragansett sachem Ninigret, has, despite academic reanalysis and Anthropological studies, remained “Ninigret” in the public’s eye; and is perhaps the most recent example of “traditional history” resisting historical truth in the public imagination. The painting itself is striking, a vibrancy of color and detail are presented to the viewer. The subject as a young man stares confidently into the distance, his lean, tanned body mostly naked, but for a red loincloth and his adornments, the symbols of status that would be worn by a sachem- the wampum headdress, made from the shells found on New England’s shores, the necklace with it’s oval metal plate at the throat and beadwork, with smaller ovals trailing down the chest. He wears knee high moccasins, and viewing them, we are drawn to the tattoo like marking of a large bird on the upper thigh. [i] A deerskin is draped over the subject’s right shoulder and arm, and he clutches what appears to be a club in one hand, with his other on his left hip, close to what resembles a metal-handled knife in his loincloth. According to tradition, the portrait was commissioned by Connecticut Governor John Winthrop Jr., as a sign of gratitude for the sachem having saved his life. In the account passed down by the Winthrop family, the painting was created in Boston in 1647. In the editions of Winthrop’s History of New England (1825) and the Journals edited by James Savage, the date of the portrait is placed as August 3, 1647. This was also the date quoted by Elisha Potter in his Historic Narragansett. The painting is mentioned again in Samuel Gardner Drake’s The History and Antiquities of Boston (1856 along with an engraving made from the portrait. It appears again, most prominently as the front piece for Frederick Denison’s Westerly and its Witnesses (1888). Both engravings differ from the portrait in background, and the sachem’s ornamentation. The Massachusetts Historical Society has, within their collection, a copy of the portrait by the well known Salem artist Charles Osgood (1809-1890), created during the same period in which he painted the elderly Thomas Lindall Winthrop’s portrait for the Society. Osgood’s copy bears some slight differences from the original. His subject wears a mantle of green wool over his shoulder. In the original painting, as mentioned the mantle is of deerskin, and thus, brown. It was not until 1925 when a copy of the original portrait was published in the Rhode Island Historical Society Magazine. The small article that accompanies the portrait, recounts the legend of its origin, and records that the portrait had been handed down in the New York branch of the family and was now owned by Mrs. Robert Winthrop. In conclusion, the author writes: “It would be interesting to know to whom to ascribe the painting of this very early American portrait.”[ii] Portrait of an early native American in the RISD American Wing, originally identified as Ninigret, donated by the Winthrop family in 1948. The painting was eventually donated by the Winthrop family to the Rhode Island School of Design Museum in 1948. Since then, the portrait has hung in the American Wing of the museum, identified first as “Ninigret, Chief of the Niantic Indians”, and then in the 1970’s, re-identified as the Sachem’s son, Ninigret II, a theory that has since been disproved. The identity of the artist has been narrowed to a few individuals, but remains in debate even today. At a symposium conducted in Providence in 2003 entitled ”Between Art and Artifact: Approaches to Visual Representations in Historical Archeology”, Ann Woolsey of RISD, and Patricia Rubertone of Brown University, presented a paper on the NInigret portrait, which revealed the conclusions of art historians, and scientific studies to narrow the date and subject of the painting. Comparisons with other early American paintings according to Woolsey, “show that the artist drew from the same English portrait sources for his pose…But the painter’s talent for three dimensional definition far surpasses the abilities of his contemporaries”. The scientific findings then, belied the traditional story of the portrait, as the first Ninigret had died in 1678, and his son Ninigret II in 1723. In fact, the Brown paper concluded that the painting was not even that of a native leader; yet the image had been used time and again in scholarly journals, identified as Ninigret, and as we’ve seen, the iconic image continues to be used today; with widely-varied attributes and speculation as to who the painting portrays. Wickimedia Commons offers students a digital file and identifies the painting as “the only truly reliable picture of a Southern New England Indian of the era”, . The artist is listed as unknown, but dates the portrait at 1681. Cassacinamon, a survivor of the Pequot War, was in the years following the conflict, a translator, assistant, messenger, and often a guest in the home of John Winthrop Jr. during the same period that the portrait was said to be painted. In spite of all this, David Silverman and Julie Fisher, authors of a recently published biography of the sachem, point out that the traditional story has a certain credence, in that not only was Ninigret in Boston at the time first claimed as the painting’s origin, but also that the description of a sachem by Roger Williams, especially his mention of wampum, manufactured by the Narragansett, and that “…princes make rich caps and aprons” of the beads, fits the subject’s adornment. In addition, the other objects of “indigenous manufacture” also place the subject in the correct time period. The historians write that the portrait gives the viewer “…an example of Indians in the process of adopting colonial textiles, and tools to make their own material and artistic lives more vibrant. The Indian in this portrait is not colonized, subjugated, converted or conquered. He draws on colonialism as it suits him. That description is quite fitting of Ninigret[iv]”. As much an enigma as the painting, is the man himself. A nephew of Canonicus, and cousin to Miantonomo, his given name was Janemo, as Roger Williams’ first mention of him confirms, when he wrote of “these nayantuqut (Niantic) men” to John Winthrop in July of 1637: “Yesterday by our neighbor Throckmorton[v] I wrote concerning these nyantuqut men your pinnace tuke (took). This bearer Janemo, (one of the chiefe Sachims of that place and chiefe souldier) came last night with neere ascore of his men to enquire about them”. Williams’ told Winthrop that the sachem was “a notable instrument amongst them”. He may only have met the young sachem, but Janemo’s reputation had clearly preceded him. While his older brother held power as a Niantic sachem, Janemo had to earn his prestige, and that had come with his war prowess during the Pequot campaign. When Janemo “visited” Williams on his diplomatic mission, it was only six weeks after the Pequot defeat at Mistic, and mere days before Sassacus would be captured and the war ended. He proffered haughtiness toward the English in the aftermath of the war, and protected the surviving Pequots that had not been sold into slavery. It was not until after the death of Miantinomo that he came into his own, changing his name, an event that occurred when a native American of stature experienced a powerful vision, or when an indigenous leader faced a great challenge or undertaking. Ninigret soon began building alliances by both marriages and payments of wampum that would increase his influence among the Narragansett and neighboring tribes. His authority would increase further with his successful raids against Long Island Indians as well as his negotiating skills in wining the release of hostages from the United Colonies in 1647. From this time on, Pessacus and Mixano, the rightful heirs and sachems of the tribe, would often defer to Ninigret with regard to affairs with the English. In 1657 he renewed the Narragansett war against Uncas, joining the Pocumtucks and Podunks in fighting the Mohegans in retribution for raids on Podunk villages near Wethersfield. Though there were reports of the killing of Mohegans throughout the Connecticut River Valley, the main target of the Narragansett was John Brewster’s trading post, which had long provided Uncas with “…guns, powder, and shot”[vi]. While Ninigret was engaged in war, Pessacus and other Narragansett sachems were selling land wholesale in Narragansett Country. Fisher and Silverman argue that while some lands may have been obtained fraudulently, the majority were legitamate sales, made by the sachems to both finance the war against Uncas, and to pay wampum to neighboring tribes and ensure good relations. Ninigret also renewed his raids against the Mauntauks, taking hostages, and as late as 1660, beheading nine Long Island Indians at Smith’s Castle; an event witnessed, and likely staged for the son in-law and family of John Winthrop Jr. who had stopped at Cocumscussoc[vii]. During that decade, the sachem and his tributaries were challenged by the onset of Philip, and his push for other Southern New England tribes to join the Wampanoag in a unified front against European encroachment and influence. Ninigret joined other sachems in a series of meetings in early 1669, including Pequot sachem Robin Cassacinamon and the aging Mohegan leader Uncas, and by July, was preparing for “a great dance” in Westerly, that would include his former adversaries on Long Island, as well as the Pequots. Only the participants know what was discussed during these meetings, but they did not bring about the alliance that the Wampanoag were hoping to achieve. As conflicts with Philip developed and escalated into war, Ninigret professed fealty to the English, and likely persuaded Pessacus to do the same, with the bloody tribute of Pokanoket heads left for the colonists at Smith’s Castle. As the war heightened, and Massachusetts and Connecticut authorities continued to harass Narragansett leaders for a treaty of loyalty, including the kidnapping of three tribal men to force the deal; the Niantic sachem’s influence waned as young Narragansett sachems like Canonchet, a “hopeful spark” for the tribe, according to Roger Williams, and Pessacus, who adopted the sachem Canonicus’ name, now prepared for war, even as they continued to negotiate with colonial authorities. A “treaty” to turn over any Wampanoag warriors who fled to Narragansett Country was agreed upon, but bickering soon ensued, and it became apparent that the Narragansett would not hand over those demanded by colonial authorities. By December of 1675, Massachusetts and Connecticut forces had entered Rhode Island and were indiscriminately killing and capturing any Narragansett they encountered. When an encampment near Wickford was attacked, and an estimated sixty Narragansett were captured and sent to Aquidneck Island to be sold into slavery, the tribe retaliated with an attack on the Jireh Bull house, and this precipitated the colonial attack and massacre that occurred at the Great Swamp. Ninigret’s biographers write that “It must have taken every bit of influence Ninigret could muster to keep his men from rushing to defend the Narragansett at the Great Swamp”. The Niantic sachem was noticeably absent, though some testimony, including that of Joshua Teft after his capture, contended that “many of Ninicrofts men (fought) in the fort”. Once the battle was over, Ninigret and his people entered the destroyed encampment and buried the slain English and fallen Narragansett. “It is uncertain whether this gesture earned Ninigret some forgiveness from the surviving Narragansetts for abandoning them in their time ofneed, or whether it just came as cold comfort[viii]”. If this act of contrition in giving those slain Narragansett a proper burial moved any of the remaining tribe, the allowal of Ninigret to let twenty of his men take up arms and participate in the defeat and death of Canonchet the following spring, caused many to see him only as a traitor to their people. Most historians have placed Ningret’s policy and actions as borne from a sense of futility in fighting the colonists, and an effort to preserve the small band of Niantics under his protection. Perhaps, as Glen Lafantasie has suggested, the sachem still had designs on acquiring a larger domain for his descendants by appeasing the English, who he was certain would win the war. Throughout his career Ninigret sought to establish himself as a great sachem, a leader equal to the legacies of Canonicus and Miantonomo; but it was not to be. As much as his biographers try to portray the sachem in a heroic light, the legacy of Ningret today is still much in dispute among the very people whose approval he sought. Much of this has to do with the colonial authorities recognizing the line of his descendents as leaders of the remaining Narragansett, who through several generations placed the tribe in an ever more precarious position by selling parcels of land to accommodate a lifestyle that emulated English royalty. Documentation from this period, penned by travelers passing through Narragansett country provide a glimpse into these years of the tribe’s declining fortunes. Riding along the Post Road from Connecticut into Rhode Island in 1744, Dr. Alexander Hamilton recorded that “Upon the road here stands a house belonging to an Indian King named George[x], commonly called King George’s house, or palace. He possesses twenty or thirty 1000 acres of very fine levell land round this house, upon which he has many tenants and has, of his own, a good stock of horses and other cattle. This King lives after the English mode. His subjects have lost their own government policy and laws and are servants or vassals to the English here. His queen goes in a high modish dress in her silks, hoops, stays, and dresses like an English woman. He educates his children to the belles letters and is himself a very complaisant mannerly man. we pay’d him a visit, and he treated us with a glass of good wine[xi]”. A decade later, Rev. Jacob Bailey wrote from Hill’s Tavern in Charlestown where the proprietor’s son told him of the natives nearby numbered “…five or six hundred, and that their king was a young man about eighteen years of age, at school in Newport[xii]”. The next morning, Bailey and his companions set out once again: “…After we had rode about a mile and a half, we passed by the Narragansett king’s house, which stands in the midst of a spacious plain. It is a building two stories high, with two or three rooms on a floor, but of late it is miserably fallen to ruin. We had a sight of two of the king’s sisters, who came to the door as we rode by.We continued our progress through the Narragansett country, till we came to the borders of Westerly[xiii]”. What these journal entries show is that the Ninigret’s who fashioned themselves as kings were never seen as royalty by the English that surrounded them, or by those traveling through Narragansett country, rather they were seen as mere subjects of curiosity. Am fascinated by the painting. It reminds me of early Renaissance in the overall feel. I saw a painting from the 1600’s of a native South American Indian done by a Dutch painter. The subject was a full frontal figure, a woman, wearing similar garb. She has a hunting basket slung over her shoulder and there is the lower part of a severed human leg sticking out of it. Obviously a cannibal, but you only notice that second to the sublime portrait!